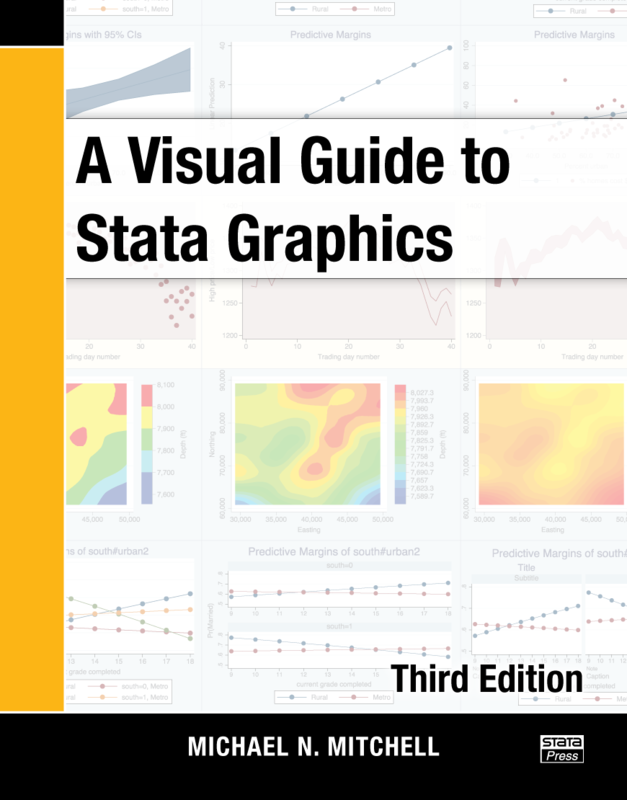 The first chapter details how to use the book, the types of Stata graphs, how to use schemes to control the overall appearance of graphs, and how to use options to make specific modifications. It also outlines a process for building graphs with the graph command. That completes the main body of the Visual Guide, but don’t skip the appendix. There, Mitchell first gives a quick overview of the dozens of statistical graph commands that are not strictly the subject of the book. Even so, these commands use the graph command as an engine to draw their graphs; therefore, almost all that Mitchell has discussed applies to them. To make this clear, he shows explicitly how to apply common options and common Graph Editor tools to statistical graphs. Then Mitchell takes you on a tour of the new marginsplot command. After that, he addresses combining graphs—showing you how to create complex and multipart images from previously created graphs. Michael Mitchell is a senior statistician in disaster preparedness and response. He is the author of Data Management Using Stata and Interpreting and Visualizing Regression Models Using Stata. Previously, he worked for 12 years as a statistical consultant and manager of the UCLA ATS Statistical Consulting Group. There, he envisioned the UCLA Statistical Consulting Resources website and wrote hundreds of webpages about Stata.